There is strong evidence showing that UK and European citizens want longer lasting and more repairable products, on the eve of an important European member state vote and the UK’s Waste Strategy. New data comes from Green Alliance’s latest report: ‘By popular demand’. Also the European Commission has conducted related research in various countries – not including the UK – which resonate with this call. They show that while over 60% of consumers try to repair their products, there are still some barriers, such as the lack of information on repairability and durability when purchasing products. In the UK, Green Alliance has shown that 65% of people feel frustrated about the short lifecycles of their products. And when these break, 62% find it too difficult to get them repaired. 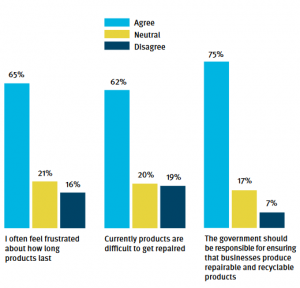 The overwhelming majority in the UK believe governments should be responsible for ensuring that products are repairable and recyclable. Source: Green Alliance’s ‘By popular demand’ report, 2018. But this is not just a materials consumption issue. The climate impact of most consumer electronics and electricals is highest when they are manufactured and distributed – before they are even used. So every time we extend a gadget’s lifetime, we space out and slow the impacts of manufacture. Extending product lifetimes, along with other initiatives like sharing products or more sustainable design, could lead to nearly 40% of carbon savings associated with those products, also according to the report. So it is not just enough to work on recyclable packaging or plastics, we need products to last longer. And these changes will not be delivered via environmental policy alone. Initiatives such as the upcoming Waste Strategy, led by The UK Department of Environment, Food, and Rural Affairs (DEFRA) need to run in cooperation with the Department for Business, Energy and Industrial Strategy (BEIS), who lead on “eco” product standards. Industrial and climate strategy need to merge, for a real change towards a more sustainable, resource efficient economy. The same needs to happen at the European level, where we see industry lobbyists attempts to water down game-changing measures for more repairable products. Citizens across Europe are mobilising to save these measures, with nearly 200,000 signatures in support, as a member-state vote approaches. The findings from the ‘By Popular Demand’ report reflect what we see at every community Restart Party, as we mentioned at the report launch with Green Alliance. Restart Parties, our community repair events, are spaces where people fix their devices together – but where they also express their anger at faulty designs as they realise that their products are breaking long before they should. Our Manchester Declaration, drafted by 25 community repair groups from Belfast to Leeds, and counting, articulates this grassroots frustration. And each of thousands of items in our database represents up to three hours of a person’s life. And for the 45% that are not able to complete a repair on the day, massive frustration. Policymakers can learn from our repair data, which we have long been collecting at our events via our Fixometer, the database engine of our community platform. This data allows us to quantify the environmental impact of community repair activities – but crucially, it helps us document key barriers to repair. Many community repair groups are now also sharing their data, either with us or through members of an open data standard. Next year, look out for more citizen-driven evidence to the barriers to repair what we own, capturing people’s increasing frustrations and demand for change. Congratulation!!! Again pointing the issue. Not only it’s completely impossible to find pieces and elements you need to repair, but also it’s a nightmare to open a device for fixing, triangle screws, thermal seal casing, and another shield to assure you give up.